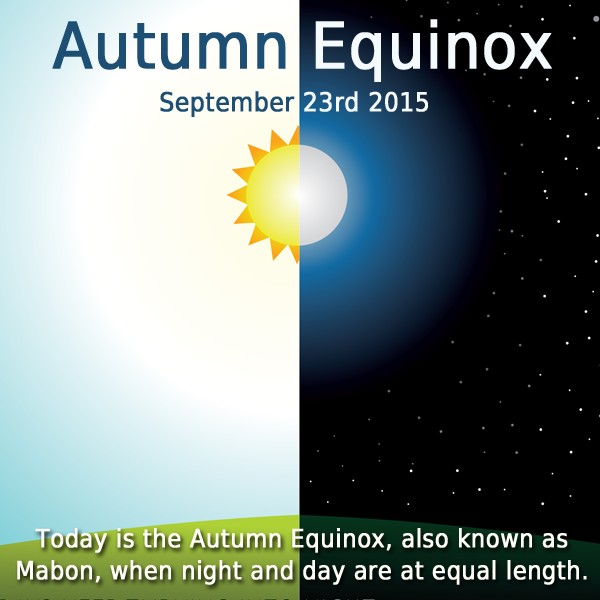 Today is the Autumnal Equinox when night and day are exactly at equal length. It is also one of the eight Pagan Sabbats, Mabon. Mabon is mainly a harvest festival, it is the last harvest before winter comes. In old times it would be a time to start stocking up on fruit, wheat, corn, and grain for the winter months ahead. This is a time of transformation. The great wheel has turned as we pass into a new season and say goodbye to Summer. The earth is going through a major shift, where darkness will now start to take over light as the nights get longer and days get shorter. Cold will start to take over warmth and death will start to take over life as plants wilt and trees start to lose their leaves, and fields become barren. Wild animals will start to gather food for the winter months and hibernate. Mabon is a time of thanksgiving. We thank the God and Goddess for all that we have and thank them for the harvest. The sap of trees returns to their roots deep in the earth, changing the green of summer to the fire of autumn, to the flaming reds, oranges, and golds. We are returning to the dark from whence we came. The Goddess is radiant as Harvest Queen and the God finally dies with his gift of pure love with the cutting of the last grain. He will descend into the underworld, his last day on earth will be Samhain when a gate will open between our world and the underworld. We enjoy the abundance of fruit and vegetables at this time. We should adorn our altars with pumpkins, nuts, corn, wheat, squash, fruits, and other seasonal fair and any falling leaves or acorns we may find to honor the season and to thank the waning Sun for the wealth of harvest bestowed upon us. Mabon is also a transition for the Triple Goddess as she goes from her mother phase to her crone phase, her final phase from her journey of the year. 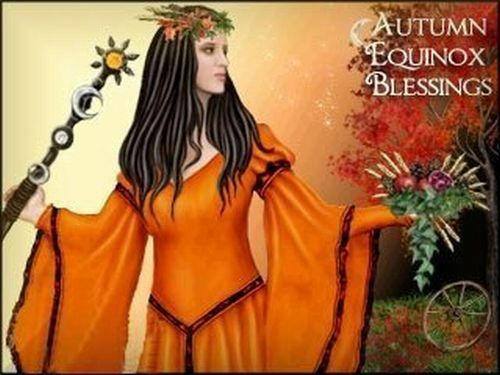 The Autumnal Equinox is a time of balance, of both light and dark, it is a time to look within ourselves and balance our thoughts and emotions, and to find balance in our lives. To embrace our dark and our light equally, as one cannot exist without the other. It is when we stop and relax and enjoy the fruits of our personal harvests, whether they be from toiling in our gardens, working at our jobs, raising our families, or just coping with the hustle and bustle of everyday life. 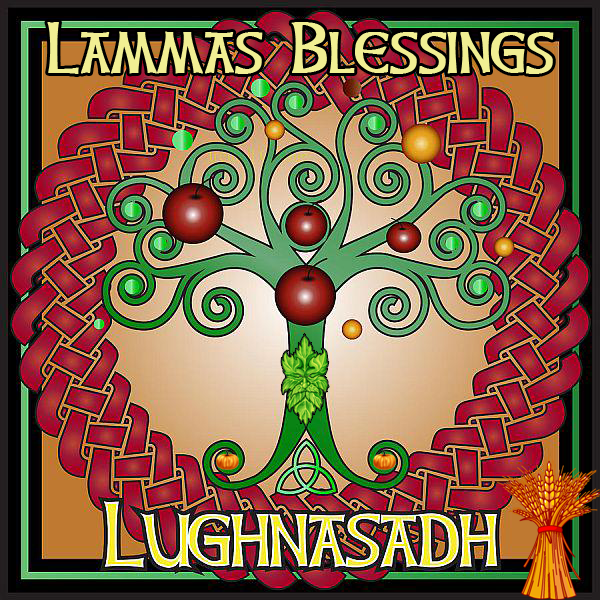 May your Mabon be memorable, and your hearts and spirits be filled to overflowing. Full written credit goes to Wicca Teachings. Full editing credit goes to Lisa Marino. 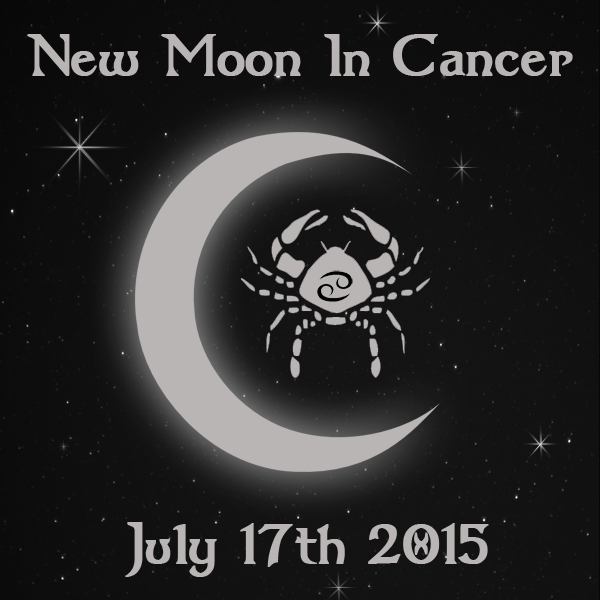 Tonight is a New Moon in the constellation of Cancer. There is a wonderful sparkle to this New Moon. Something feels refreshing and even inspiring. Soak in the fabulous energy. Take time to be near water. A stream, lake, river, waterfall, rain, or the ocean. If you are not able to be close to a body of water, taking a nice bath with sea salt will do too. It is helpful to attune yourself to the water element. Flow and be. This will refresh, renew, cleanse, and heal you. This New Moon in Cancer speaks of germination and new life. 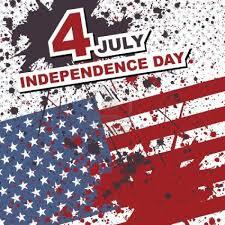 It encourages us to have faith in our potential alongside a deep resolve to ensure that potential is fulfilled. Just as an acorn contains the imprint of the tree it will become, so too do we contain our future selves in a form within us, waiting, slumbering, gestating, until the time is right to come forth into life and purpose. In the darkness of this New Moon we are invited to dream our future selves into being. This is an intuitive Moon that has so much it wants to share and asks us to be ready to receive. It reminds us that no matter how often we may feel the necessary changes are too great for us to implement, the fact is the change has already happened. We are already transformed, we just haven’t realized it yet. It wants us to stop striving now, to relax, be still and recognize the deep peace within, in which our potential has its being. There is nothing to add, it tells us, nothing to do and nowhere to go. At this moment we have everything we need to be who we are meant to be. We are already complete. This is a good time to commit to personal goals that express the positive energies of the sign of the Crab. These include honoring our deepest, most irrational and intimate feelings, recognizing the sense of security and safety we need from our homes, jobs, family, partners, and friends. Allowing ourselves to accept support and offer support to others. You will be feeling deep and raw emotions. Your feelings reveal what you truly love and value. They are your guidance system. Your passion for life is fueled by your feelings. They nourish your creative, artistic, and intuitive abilities. In fact, having all the wealth in the world does not matter if you do not feel good. Your feelings count. Trust your emotional instincts on this New Moon. Tap into your deepest darkest feelings for they will reveal who you really are and what you truly want. Let the waters of Cancer wash over you and cleanse your spirit and soul. 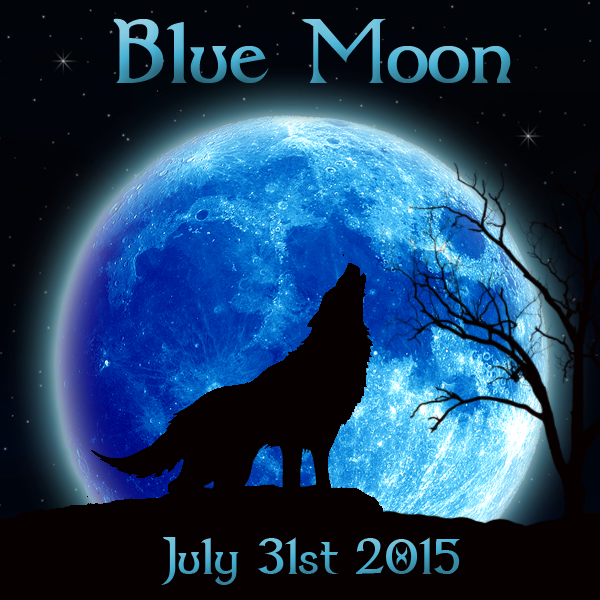 Have a Blessed New Moon. May the Goddess watch over you. Written content fully credited to Wicca Teachings. It has been edited for cohesiveness.